Love trees but mystified about how to recognize them without leaves? This workshop will describe key characters for recognizing a dozen common Michigan species by twigs, bark, and habitat. We’ll review how to use keys to identify woody plants based on twigs. Twigs will be provided, but please feel free to bring any twigs that you’d like to figure out (preferably from natural areas rather than horticultural plantings, as available keys focus on native species). Weather permitting, we’ll do a brief walk outdoors to look at trees in person. By the end of this workshop, you should be able to recognize a few trees by sight and should feel more comfortable using keys to identify unknowns. 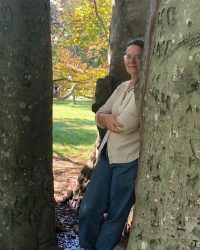 Jacqueline Courteau is a student and lover of trees, and always enjoys an opportunity to pass along knowledge that she gained from teaching Woody Plants under Burt Barnes and Herb Wagner (UM), and Trees and Shrubs for Gary Hannan (EMU). She earned a Ph.D. in ecology at University of Michigan in 2005 and presently runs a small natural resources and ecology consulting business. She has researched and reported on topics including oak and hickory regeneration, invasive species, and ecological assessment, monitoring, restoration and stewardship for organizations including parks, Huron River Watershed Council, Michigan Natural Features Inventory, and the Michigan Department of Natural Resources. She also wrote overviews of more than 100 plant species for the Smithsonian Institution's Encyclopedia of Life.